Meet Bank, the green sea turtle who lives in Thailand! A photo of Bank taken four days before her surgery, her belly filled with nearly 1,000 coins. When my husband told me the story of Bank, the green sea turtle, all I could do was shake my head. Fortunately, her story seems to be having a happy turnout. This is just one of the crazy, almost tragic, things that people can do to sea turtles, harming them without thinking. 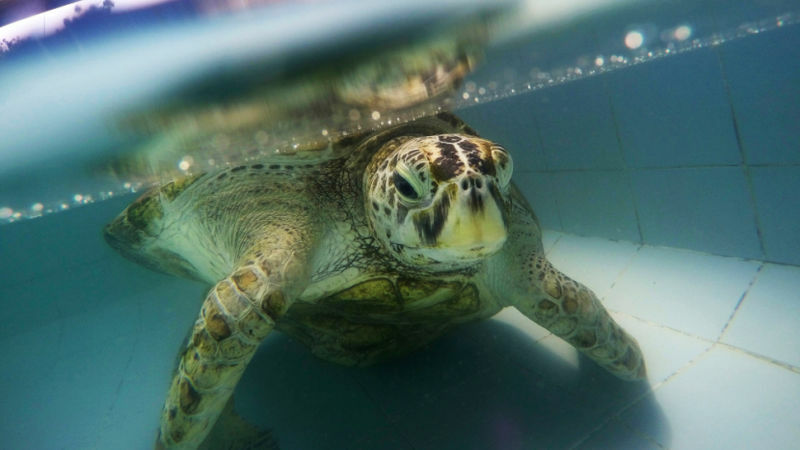 There are more photos in the story that you can see of this beautiful green sea turtle, Bank. Once you read this, you’ll understand her nickname. Hopefully you haven’t heard it yet. I couldn’t get the link to go to the Yahoo news page directly, so you’ll have to go to my art page on Facebook and then click on the link there. Sorry about that! It is a short article, though. Please go check it out. Tell me what you think! P. S. If you ever see a sea turtle in a pool anywhere…please don’t toss it a coin!!! Posted on March 8, 2017, in Sea turtles and tagged “Bank” the Thai Sea Turtle, Green Sea Turtle,. Bookmark the permalink. 8 Comments. Poor baby hope its well on the mend Patsy. I couldn’t believe it when I heard about this – it’s so incredibly horrible, but I’m glad she’s doing ok now. I hope she’ll become a hero in one of your stories! I couldn’t either, Sheila! I feel like I should keep up on sea turtle news a lot more than I do; my husband sees these things more often than I do, but then tells me about them. 🙂 Maybe she will…maybe she will! Oh my word! That’s horrible, Patsy. I’m happy to hear Bank is okay.